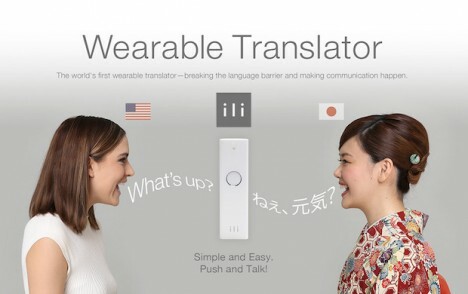 A slim white gadget worn around the neck, the portable Ili translator is clean, simple and easy to use: a microphone records sounds and a speaker delivers the message in a target language. 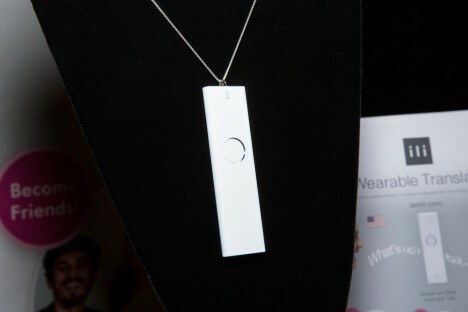 Amazingly, it relies on a built-in database so it does not need a wireless, Bluetooth or other connection to work. Perhaps this will mean there is no more need for phrase books (physical or digital) for weary travelers who are game to wear one extra small accessory. How well it works remains to be seen, but its creators claim it can operate between English, Chinese, Japanese, French, Thai and Korean, its database growing with future updates. If it saves someone taking their phone of their pocket, it might also provide a smoother user experience than other translator apps. Next step: a babel fish ear wearable that need not even be seen or touched (at least if the Hitchhiker’s Guide has its way). Meanwhile, even if the translations are imperfect, it could still work well for a traveler in a hurry to catch a train (or find a restroom) in some foreign land.